The bathroom is a necessity to every home. However, a great bathroom can become a beloved area of the home. Not only do the best bathrooms give you the tools to get ready in the morning, but also increase the resale value of your home. 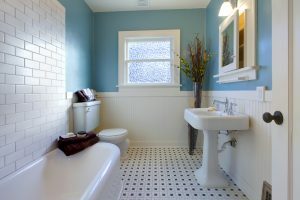 One of the factors that defines a home is often how accommodating a bathroom is to your needs. Oftentimes, though, your bathroom may be outdated, and it may seem like you do not have the space for a remodel. This is untrue. A remodeling expert can help to redesign small spaces for the perfect bathroom renovations. An important aspect of redoing a small space is to utilize the area you have efficiently. Existing windows and doors will typically need to remain in their location without a costly remodel. Therefore, plan around these areas. If it makes sense to move the toilet to another wall in order to give you more room by the sink, then look at this option. Also, see how changing the size of the shower or tub will benefit the room. Does removing an unused tub create more space? Does changing a shower with a tub to a standing shower make your bathroom roomier? There are so many options to consider when renovating your bathroom. Other perks of bathroom renovations are new fixtures and storage spaces. A small bathroom can benefit from a smaller vanity. Create space by moving storage off the ground and onto the walls by using shelves and cabinets. Add mirrors to your bathroom to create the illusion of more room. There are many ways to update your fixtures in order to take what seems like a small bathroom and enlarge it. A professional in bathroom renovations can help you transform the space you have into the place of your dreams. Let an expert help turn your ideas into realities.